Alter Eco is pretty smart with their truffles. Basically, they're the organic, fair trade version of Lindor truffles. Small, round, and individually-wrapped, they come in four flavors: Black (dark chocolate), Velvet (dark milk chocolate), Salted Caramel, and Sea Salt. I'm pretty sure I usually only see the first two for sale, though. The Black Truffles are in purple wrappers and the Velvet are in blue. What is so convenient and enticing about these truffles is that stores will sell them individually (as sometimes the Lindor truffles are sold and sometimes Ghirardelli squares). So while you're out grocery shopping, you can just pick up one or two to have on your way home. It seems like such a simple thing, but this is a need that should be filled: small, quality, everyday treats are important options to have. It keeps you from wanting too many sweets and it keeps you from stopping somewhere else for KitKats or Entenmann's (I say somewhere else because, of course, it's Whole Foods, not Safeway or other grocery stores, that sells these truffles). So. I appreciate the concept from Alter Eco. Good chocolate bars can be a great value because they can last a while, but little chocolates have their place, too. I forget which of the two I prefer; I think sometimes I get one and sometimes the other. 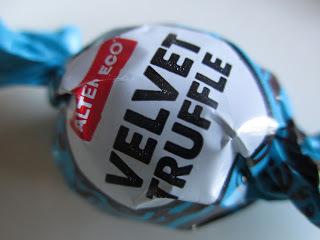 Today I'm going over the blue-wrapped Velvet Truffle (I may or may not do a separate review at some later point of the Black Truffle because, frankly, they're quite similar). 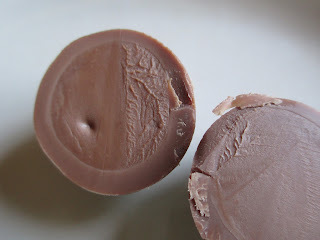 Each truffle is a round piece made of two halves put together; the seam runs around the circumference. If you cut open the globe, you'll find light lines outlining the shell that holds in a soft center barely distinguishable from the shell. In texture, you will indeed find yourself thinking of the Lindor truffles: these have that same cool and creamy meltiness. The inside vanishes so quickly, lightly, and sweetly--and then the shell follows soon after. You wonder, for a second, if it's pretty much the same thing as a Lindor truffle. But, no, it's different--in a way that you can't quite place. Something besides just the chocolate. The difference is the oil. I know. I said oil. Oil generally isn't something you want to find in chocolate. But in order to have chocolates with a shelf life of longer than two weeks, well, they have to have some kind of oil. What Alter Eco has done, though, is clever. They've used coconut oil. Don't worry about getting an extra coconut flavor thrown in there: I'm not overly fond of the taste of coconut but it was a while before I realized that that's what's in these truffles. What the coconut oil does is keep the ingredients of good quality and help provide a very particular sort of texture. Oh, yes, and you may have been wondering about the sweetness level, since this is the milk chocolate version of the truffle. Not too overly sweet--but sweet enough. Looks like there is a lot of extra cocoa butter added, so I'm not entirely sure why it's called "dark milk chocolate" (which I generally consider milk chocolate in the 45% cocoa content range that's just starting to get some of the depth and richness of dark chocolate). It's just milk chocolate--not too complicated in flavor. Fairly straightforward, in fact. So if you want more depth, maybe go with the Black Truffle instead. Milk chocolate lovers, though, you won't be disappointed by the Velvet Truffle.